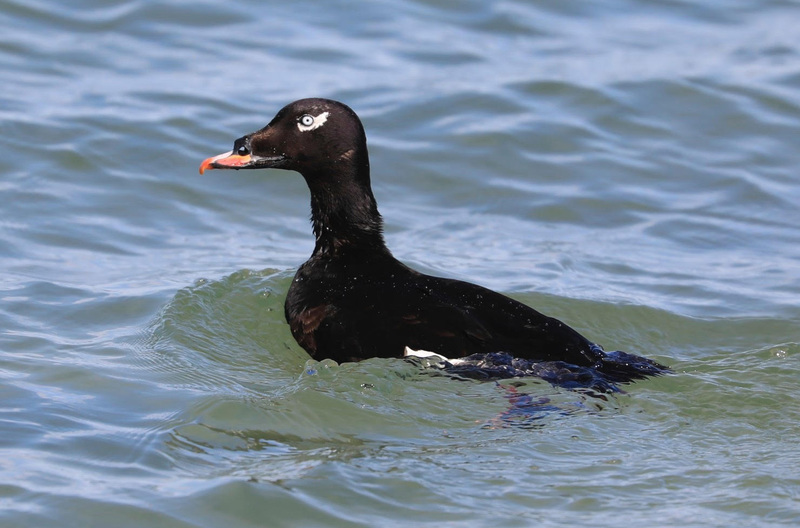 Scoters are black sea ducks that winter in the coastal waters around Cape Cod. They eat mostly mollusks (especially clams and mussels) and crustaceans. There are three types of Scoters in North America; Black Scoters, Surf Scoters and White-winged Scoters. The males’ orange bills are quite spectacular, especially the Surf Scoter. A male White-Winged Scoter was brought in from a Brewster beach in mid-February. He was hypothermic, weak, wet and dirty. A large portion of skin was torn from under his wing, and the bone, ligaments and tendons were exposed. The wound was very fresh. It was an odd wound; very clean with no visible punctures. The x-rays showed nothing significant. The large open wound across its elbow made treatment a bit tricky, so we consulted veterinarian Dr. Louise Morgan. She examined the bird and decided not to suture the skin in such an active area that is constantly being stretched. The sutures would probably not hold. Instead, we would treat the wound with fresh dressings and Manuka honey every 2 days, and administer antibiotics. We had to handle this poor duck at least every two days, removing the bandage, cleaning the wound, reapplying the bandage and wrapping the wing. He was so “good” because Scoters turn into opossums when they feel threatened. They gape open their mouth, and kind of hiss when you approach, but when you capture them in your arms, they go limp and seem to play dead. Sometimes their head will actually hang down as they are held. We would lay him on his back, provide care to the wound and flip him over. He was easy to remove from our pools, he would dive underwater and swim into our net, then hop out into his prepared crate for the night. He had a great appetite and kept a pretty tidy crate (considering he was a duck). We could easily hold him up to flap his wings for flight therapy, and I don’t recall him biting anyone. The wound healed nicely, the way bird skin does. The skin fills in without scar tissue, the feathers grow back in the right places, all pointing in the right direction. It never ceases to amaze us. The Scoter rehabilitation included; wound care, swim time, physical therapy, lots of egg, krill, oyster shell and fish. He was finally ready for release in time for his migration to Northwest Canada. We released him at Corporation Beach where the sea ducks were still congregating. He jumped out and swam toward a raft of Common Eiders.